Questioning the 4 man group part of this. had a 5 man group and flew in to the area, once started, 3 large demons and 7+ shadow humanoids spawn and promptly own the entire group, 5 wipes then gave up. Four manned it with a Holy Paladin, Resto Shaman, warrior and rogue. Very tough, recommend bringing five well prepared players. Stay out of flamestrike on the third wave, this is key; once you get the third wave down the boss is a relative pushover. who drop the quest item? We downed Val'zareq the Conqueror with 70 feral druid tanking, 69 feral druids dps'ing/spot heals, and a 70 mage... pretty easy. 2 quests give total 650 rep with sha'tar..
Soloable to frost mages, use frost novas/freeze (took 4 novas/freeze till death) to keep adds away and kill the boss. For those with a flying mount, the quest itself is incredibly easy. Flew in overhead, flew behind the crystal, and got just close enough to talk to General Auralion (the guy in the crystal) and complete the quest. Don't forget - by accepting his next quest, you start a long battle that will require a group. That's why this one is marked as a 4-man. first go to the end of path of conquest (upper) and start killing dragonhawks. when pat comes round blow CDs and burn first mob. sooner or later your pets gona die (around 2nd mob) and you will kite n kill the next 1-2 pending on your health. tank and spank fight, he does an arcane shot every so often(his only attack) and fails@hit rating (i pulled agg tanked for 20 seconds poped aspect of monkey/deterance and bandaged w/o getting hit). any chance marcus is a Gladiator reference? Does anyone know if it will directly start the follow up? Level 80 decently geared moonkin druid could solo this so if you're looking to complete Shadow of the Betrayer achievement, this can be done. I'd suggest a good tank or melee that doesn't bleed much and a healer duo to make this easier. I was just able to solo this quest as a decently geared level 80 ret pally. Not hard at all, just had to heal 2 times through out the entire fight chain. Soloed as a lvl 80 ele shammy, pretty simple fight. My guess is most anyone with some healing/aoe capabilities could pull this off. Easily solo'd as an 80 rogue. Soloed this with a lvl 80 prot paladin. Really easy, completed it in less than 5 minutes. hes that hard to see. just look for a blood elf whit 3 other blood elfs around him. ended up killing him as a 73 prot warrior. Killed them all within 10 seconds. At level 80, this quest is very easily solo-able. I read through both pages of this and nobody mentioned if a level 80 could solo this so I was a bit worried but its 5 waves of mobs with 6-24k hp and then a final 'boss' with 114k hp. If you are struggling to find the mob that drops the book to start this quest ... spam click this macro in the area he spawns. So I just killed this guy like 5 times yesterday and 1 today and he does not drop anything. I'm alliance on Cenarion Circle... did they take this quest out? An easy soloable quest. Sneak up and talk to the green crystal with the gold question mark over it. As suggested previously you can fly in from behind to avoid the mobs. Talking to the guy in the crystal completes this quest and leads you immediately into the next one in the chain, "Battle of the Crimson Watch," in which you are attacked by waves of elite mobs right where you stand. I soloed them with no problem and this quest completes when you return to Shat and speak with A'dal. Oh, almost forgot to mention- I'm a lvl 85 ret Pally. Just did this quest solo with an 85 Arcane Mage, just to see if it could be done. Even with a 340 average item level, most of the mobs were being 1 shot. Other than the first wave (Too many mobs to kill before they reach you. Just AoE them down), the other waves were trivial. Lost maybe 5-7k HP during the entire event. After my success with my mage, my 85 Mut Rogue went as well. Most of the elites are immune to stuns, but you can burn them down with brute force. Recuperate makes this a pushover. If you're an 85 of (dare I say) any class/spec capable of dealing damage, you can do this quest. O.o just completed this line, When Illidan was talking at the end and went through the "insert character name" here bit.. He named my pet, not me. Thats right, shale spiders are so awesome, bosses fear them more than hunters. edit: link was screenshot. - not up to wowhead quality but can find it on Vaelkari's photobucket. Tried soloing this with my 68 prot pally, made it through the first wave, and almost through the 2nd before was CC'd (feared) and didn't have time to pop WoG. Didn't try again because I knew I was gonna need more DPS. I'm willing to bet this is 2 man-able with skilled players at around 68-70. No one else around my level was on in my guild, otherwise we would have tried it. so you probably need to be 68 or close for the quest item to drop. If you are 85 and just want to do the Twenty-Five Tabards achievements, go and kill Val'zareq the Conqueror (he is walking around the zone), he will drop The Journal of Val'zareq then you give it to the Crystal Prison, it will give you Battle of the Crimson Watch, start the event, finished it and then go to Shattrath City to get you tabard. You will get Green Trophy Tabard of the Illidari or Purple Trophy Tabard of the Illidari. Both tabards are random and they will be in the Offering of the Sha'tar. If you want both tabards you can do this: before you loot the tabard. Remove your auto loot, look inside the Offering of the Sha'tar see what color of tabard you got (dont take the tabard) go and speak to Garyl <Tabard Vendor>in Orgrimmar tell her that you lost your tabard of the Illidari, choose a different color of tabard that you have and then loot the Offering of the Sha'tar box. And you will have them both green and purple. It is simple and quick. Soloed at level 85 very easy. The comment by (Noventa) above is right on about the tabard TY for your help. Barely managed to solo as a 73 blood DK in cobalt tank gear. The hardest part was the two flayers, which fear and then cast on you. I wasn't high enough to resist anything so I nearly bought it then. There is a very, very short time to eat in between waves except for the last guy, who was way easier than any but the first wave - he gives you a good 30-45 seconds while he RPs, so eat/drink up. Unless you outlevel it by more than 73, or you can heal, I'd bring a friend. For those wanting to loot this but can't because the area is phased it's because you're a lock who is on the Green Fire questline. You will not be able to unphase this until you have green fire - even abandoning the quest will not unphase it. Just FYI. Blizzard should just make this a 100% drop. Just did this today and I got both tabbards as the reward. I didn't have to pick. Locate Marcus Auralion, High General of the Sha'tar, at Crimson Watch. Look for him inside a crystalline prison. 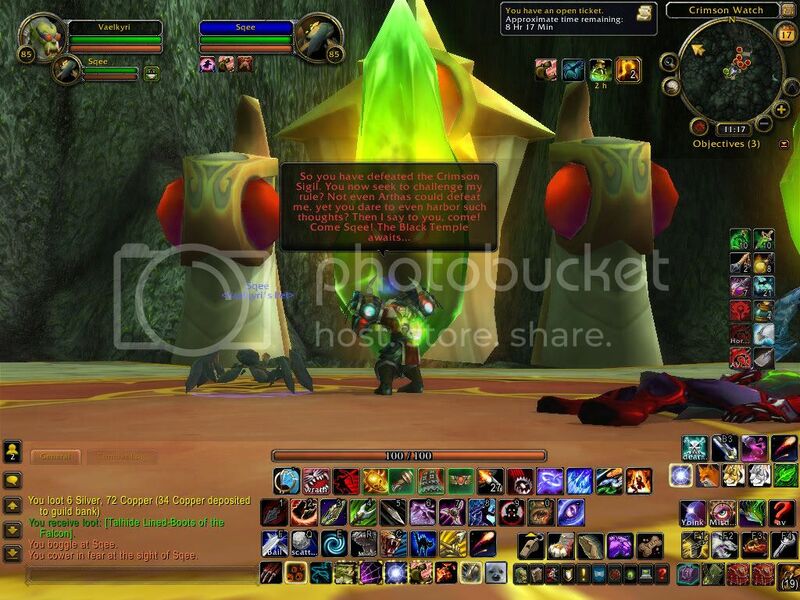 This journal documents the recent activities of Illidan's armies. It also explains why Val'zareq was parading around the Path of Conquest. He was personally responsible for the capture of a high general of the Sha'tar. This general is being held at a post known as Crimson Watch, located at the southern end of the Path of Conquest. A mysterious faction, calling itself the Crimson Sigil, is charged with his incarceration. If you choose to investigate, it would be wise to bring allies. Wha... What are you doing here? The Crimson Sigil is a group comprised of Illidan's elite minions. They are at the top of the chain of command for all Illidari forces outside of the Black Temple. These soldiers communicate directly with the Betrayer here, carrying out his orders without question. They are the fiends that will undoubtedly lead an assault on this world, trampling under foot all that would stand in their way.